Feeling on the sad side today. A new friend of mine lost one of her greyhounds about 5 or 6 weeks ago, was a lovely greygirl named for royalty, and rightfully so. She also had been having problems with their older greyboy, and after so much effort to help him, he suffered pulmonary embolism and passed away last night. She is now pet-less and I could just feel the anguish in her words. She and her OH seem such lovely people and mentioned how terribly quiet the house was without him. (what heartbreak!) Having gone through losing my pets so many times, instead of hardening, I seem to feel other’s pain ever more severely when they lose their animals. We had a very bad year a couple of years ago where we had many, many elder and special needs greyhounds and for a while we were losing them one a month or so. It hurt so much, so often, for a while I became a bit numb from all of the tears and anxiety. It is so very hard to lose a pet, but something I have not yet experienced is becoming pet-less through loss. I have always gone and brought in another. My Mom has asked me several times why I keep doing it. I mean….setting myself up to continually go through heartbreak after heartbreak. As I get older I keep thinking, ok I just can’t keep taking this. And then I do it again. I am addicted to these beautiful animals, and I love having them around me. The love and memories they impart upon me must be worth all of the pain I feel when I lose them. I really can think of no other excuse. 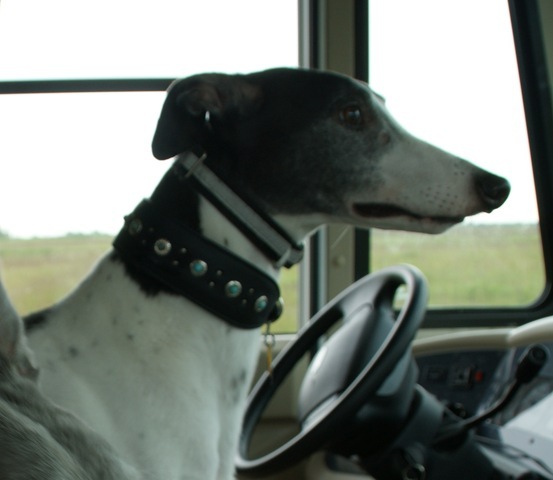 They make me feel good…a Greyhound high.